Don’t Throw Your Hats In The Air Just Yet. A hike in interest rates next month is a done deal – and it will be the first of many. The virtual certainty of higher rates – presaged by Graeme Wheeler’s speech last week – is presented in the media as bad news for home buyers, and that it certainly is; but its real significance goes much wider than that. What it really tells us is that, despite all the self-congratulation about the long-delayed recovery from recession, our long-term problems are not only unresolved but are likely to get worse. The truth is that we cannot be allowed to grow at anything like the rate that out most important competitors in Asia take for granted; and the reason for that is that our past failures have ensured that we are a fundamentally uncompetitive economy. Because we are uncompetitive, we dare not grow at a reasonable rate for fear of renewed inflation and worsening our perennial balance of trade difficulties. Any increase in purchasing power would go, not on investment in increased domestic production from New Zealand industry, but on the import and consumption of goods we are no longer able to produce ourselves. And even more predictably, any increase in the money supply will end up unerringly in an inflated housing market, creating the illusion that people are better off than they really are and encouraging them to spend their unrealised and supposed equity on yet more imported consumer goods. Those problems would mean in turn an increased need to borrow and to sell off our dwindling assets, so that higher interest payments and repatriated profits would impose further burdens on our balance of payments. No wonder the Governor of the Reserve Bank has taken fright. The whole point of the rise in interest rates is to choke off the economic growth that we might otherwise aspire to. 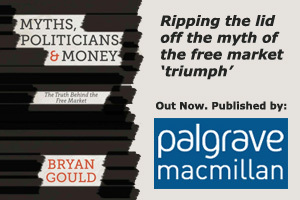 The monetarist doctrine that has dictated our economic strategy for three decades stipulates that a rate of growth that would fully utilise our resources and accordingly mop up the pool of unemployed must by definition be inflationary – so much for faith in the ability of an efficient and competitive market economy to generate increased production. The Governor’s intervention will at least be welcomed by some employers who fear the effect of full employment on wage rates. Applying the brakes at this early stage is a certain recipe for exercising a downward pressure on wages and, in due course, for a further transfer of wealth from wage-earners to asset-holders. Little wonder that it is applauded by a minority. The tragedy is that higher interest rates at this stage of the cycle will actually make our problems worse. The higher rates we will have to pay to mainly overseas and short-term lenders will not only increase the burden on our balance of payments but the inflow of foreign funds will push up the exchange rate of our already overvalued dollar. Our own domestic producers will find that they are even more handicapped in the battle for markets at home and overseas – even less able to withstand price competition from rivals whose governments pursue very different strategies designed to maintain their competitive advantage. Indeed, some of our trading partners make no secret of their preference for following a quite different course. Singapore, for example, uses indices of competitiveness, not the inflation rate, as the primary determinant of macroeconomic policy. China has for years maintained their currency, the renminbi, at an undervalued level, tying it to the US dollar to ensure that they lose none of that advantage. The government of Shinzo Abe in Japan has gone even further and has engineered a 35% depreciation of the Japanese yen so as to set the economy back on a sustainable growth course. They have achieved this by doing the exact reverse of the higher interest rates that are now in prospect for us; instead of tighter monetary conditions, they have significantly relaxed monetary policy but have ensured that the extra money available is carefully directed into productive investment rather than consumption. Western economists are entirely ignorant of the great post-war Japanese economist, Osamu Shimomura, and of the successful investment credit creation strategy that he pioneered and that is again being applied by Shinzo Abe. Locked into our tight little certainties, we cannot conceive that the rest of the world has anything to teach us. It is a safe bet that Graeme Wheeler, who is no fool, understands these issues perfectly and recognises the futility of the strategy he is pursuing, but is at a loss to know what to do about it. He will know that our current and much-touted “recovery” depends on the stimulus provided by Christchurch reconstruction (why did we have to wait for an earthquake to make that kind of investment? ), high – and probably temporarily so – dairy prices, and our old friend, an unsustainable and damaging housing boom. These factors will either be short-lived or positively harmful to any long-term recovery. When they have been exhausted or have done their worst, we will be left with even fewer options, and an even grimmer outlook, than we have at present. It’s too early to throw hats in the air just yet.